CRIMEA, Ukraine -- President Donald Trump may no longer be the undisputed architect of the most infamous potential border obstruction in the world, as the Kremlin has thrown its hat in the ring. A mural showing the Crimean peninsula in Russian national colours on the wall of a building. Russia’s security services are currently looking for a company to cordon off 30 miles of land in Crimea—a territory that the majority of U.N. does not even recognize as part of Russia. The Black Sea peninsula has been an undisputed part of Ukraine since before the collapse of the Soviet Union, until 2014 when masked Russian forces seized the region during mass popular unrest across much of the rest of Ukraine against the country’s pro-Russian government. 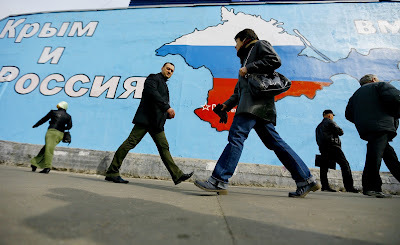 Regardless of the international reaction, Russia has poured resources into linking Crimea to its own territory, currently building a bridge to the region as no land link with Crimea exists now. According to Russia’s state tender website, the federal security services (FSB) are also looking into shutting out Ukraine’s mainland from Crimea with a $3.7 million structure in Crimea’s Perekopsky district—the one with the longest stretch of land border with Ukraine’s Kherson region, Russian state news agency Itar-Tass reports. Although politically the structure would inject more controversy into fraught Kiev-Moscow relations, the construction itself will likely be much less physically imposing. The contract sets a height of only two meters and a deadline of only a few months, as work is scheduled to finish before the end of 2017. Even if the fencing covers the entirety of the Perekopsky district’s border with Ukraine’s Kherson, there are at least five other road links from other parts of Ukraine into the peninsula.